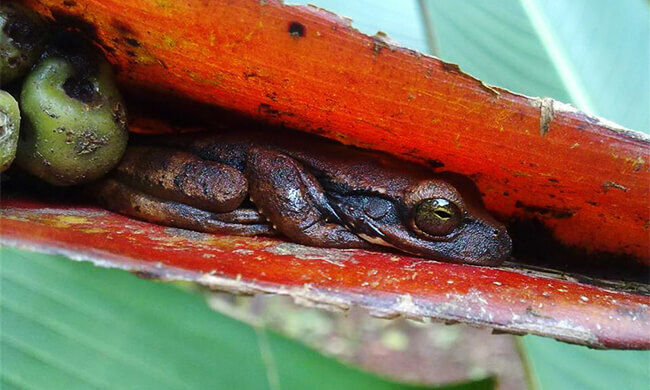 This half-day tour is great for anyone looking for an insight into the world of butterflies and frogs with a taste of the Monteverde local culture. Your tour begins when you are picked up from your hotel in Monteverde and driven to the CASEM (Cooperative of Artisans of Santa Elena Monteverde). There you can view and purchase the handicrafts that the women of Monteverde make by hand. Then head to the Butterfly Gardens. Costa Rica has over 14,000 species of butterflies with approximately 750 found in Monteverde Cloud Forest! Your bilingual guide will take you through the four gardens, each simulating different habitats (lowland, mid-elevation, forest under story, and highland forest edge). These gardens will show you the different species of butterflies found in the country. There is also a rearing chamber where you can see caterpillars becoming butterflies, as well as a nature center where you will learn about other species of insects such as scorpions, tarantulas, and stick insects. Then head on to the Frog Pond! In Costa Rica there are nearly 140 species of frogs and toads that have been identified. At the Monteverde Frog Pond you will find approximately 40 terrariums simulating the habitats for different species of frogs and toads. Admire some colorful frogs such as the famous red-eye tree frog and the blue jean. Tour includes: Transportation, entrance fees, bilingual guides. What to bring: Comfortable clothes, camera, extra cash.